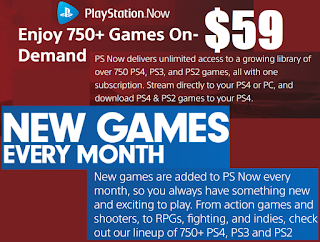 One Year Playstation Now Free Games Streaming Service Subscription $59 (Reg $99) + Free Instant E-Mail Delivery. Unlimited streaming access to over 750 PS4, PS3, and PS2 games you can play on PlayStation 4 and PC anytime you want as much as you want for the entire year. With the selection they have it should save you a ton of money on having to buy games and this is an awesome price, $40 off and the lowest price it's been!